In Mexico Blue Dream, our people make the difference. We love what we do, and we do it with love. That’s what makes us stand apart from other Dive Centers in Playa del Carmen. Our international, multilingual team combines expertise and knowledge, both in and out of water, to offer you a friendly and professional service. The professionalism and experience of our instructors and guides ensures complete safety as well as pure diving enjoyment. 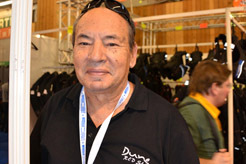 Dune, and more specifically Gérard Besse, originally from France, opened his first dive center in 1997, in Egypt. Over 20 years later, Dune has now 2 dives centers in France, 1 in Egypt, 1 in Bali and 1 in Mexico. Diving experience can also be on a boat, so Dune also developed liveaboards in Egypt, Sudan, across Indonésia and in the Maldives. Dune, with the Mexico Blue Dream experience is now offering the best dive spots of the Riviera Maya with his dive center in Playa del Carmen, Mexico. Mexico Blue Dream is always striving towards excellence in diver training. Whatever your ambitions, whether it is beginner training, continuing education, or rebreather diving, our team of instructors have the knowledge and experience to assist you in reaching your dreams. Our friendly and competent staff is always ready to fulfill your wishes and requests. Speaks: Spanish and basic English.